I’m Ehsan Alipour, the Oliso founder and CEO. Along with my fellow Olisians, I want to extend a warm hello to all the Grommets out there. We are extremely honored to be at the Daily Grommet and are very excited to share our story and products with you. The Oliso Smart Iron has come a long way: from tinkering in my school’s product design studio to distribution in 19 countries and a growing base of Oliso fans worldwide. We believe that great products come from listening to people, so I’m here to answer any questions you might have—about ironing, product design, Oliso or whatever you want to throw my way! I'm attempting to decide between the first two models (not the third, "professional" model. How would you suggest I decide? What would be the reason to by the second model vs. the "entry level" model? If you iron occasionally in small batches, I would recommend the first model.If you are ironing in batches or more frequently, I would recommend the TG1100 with the higher wattage and the longer cord. You are very smart to use sewers and quilters as your target group. They are power ironers...if it works for them, it will work for anyone! It happened very naturally.When we first launched our first model,Sewers and quilters were the first group to find us.Once we learned more about their needs, we launched our professional TG 1600 specifically for them.They are our biggest fans and our toughest customers since they use their irons 10 hours a day:) We love being part of their creative projects. i just wabt to know, the water you add, is this a distilled only or can you use regular tap water? We do not recommend distilled water for any irons.The safest would be to use either bottled drinking water or filtered water which has taken the hard minerals out. They weigh about 3.5 Pounds. The best way to clean the-sole plate is to let it cool down and wipe it clean with rubbing alcohol. Costco is having a Roadshow in my city this week. The model they are offering is TG1200. 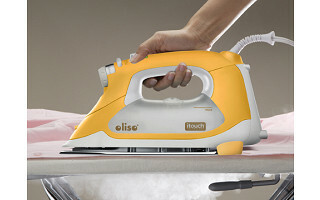 What is the difference of this iron when compared to Models TG1100 and TG1600. @Carol Keech: It doesn't look like the 1200 is in their normal line of products. It was probably manufactured specifically for Costco. We have friends who love to iron, and friends who don’t. No matter which camp you fall into, Ehsan Alipour has created an iron that will make short work of the pile of grandma’s linen napkins waiting to grace your holiday table. Ehsan started researching household irons after he noticed that his mother and aunt spent a lot of energy manipulating their steam irons, shifting them constantly from a horizontal to an upright (and unsteady) position. So he invented Oliso, the iron with a brain. It’s a cult favorite among quilters, seamstresses and other ironing enthusiasts who spend a lot of time in the pursuit of wrinkle-free fabrics. 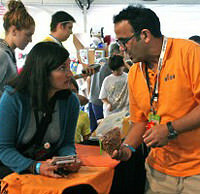 Ehsan is pictured here with Daily Grommet's Joanne at Maker Failre in New York this fall. With Oliso, there’s no more constant lifting or fear of burning and scorching. 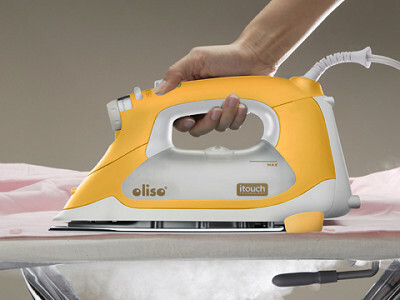 Ehsan’s iTouch technology allows the hot surface of the iron to lift itself as if by magic levitation then return to the ironing board -- with a simple touch -- when you’re ready to press. He describes it as “little push-ups” that spare you from constantly repositioning the iron and eliminates the risk of tipped-over irons. With Oliso at your fingertips, that stack of laundry will be done in minutes.